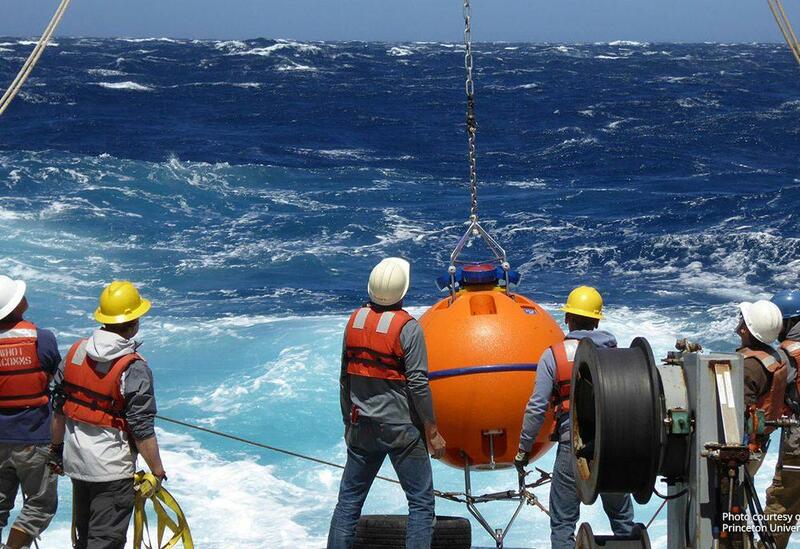 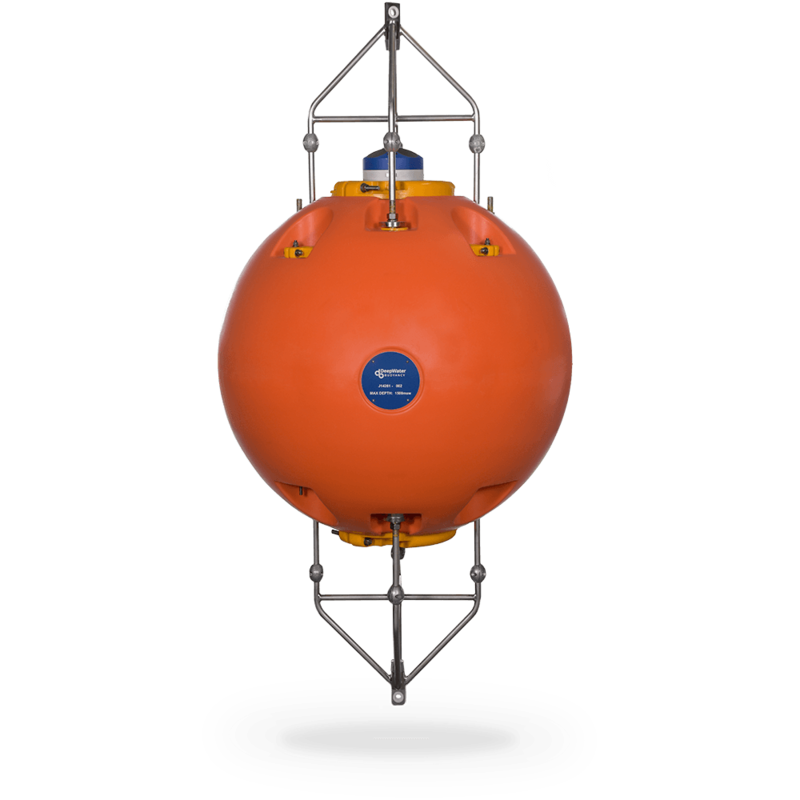 DeepWater Buoyancy understands the value of data recovery, as well as, ADCP technology, oceanographic operations and what it takes to supply products that ensure success. 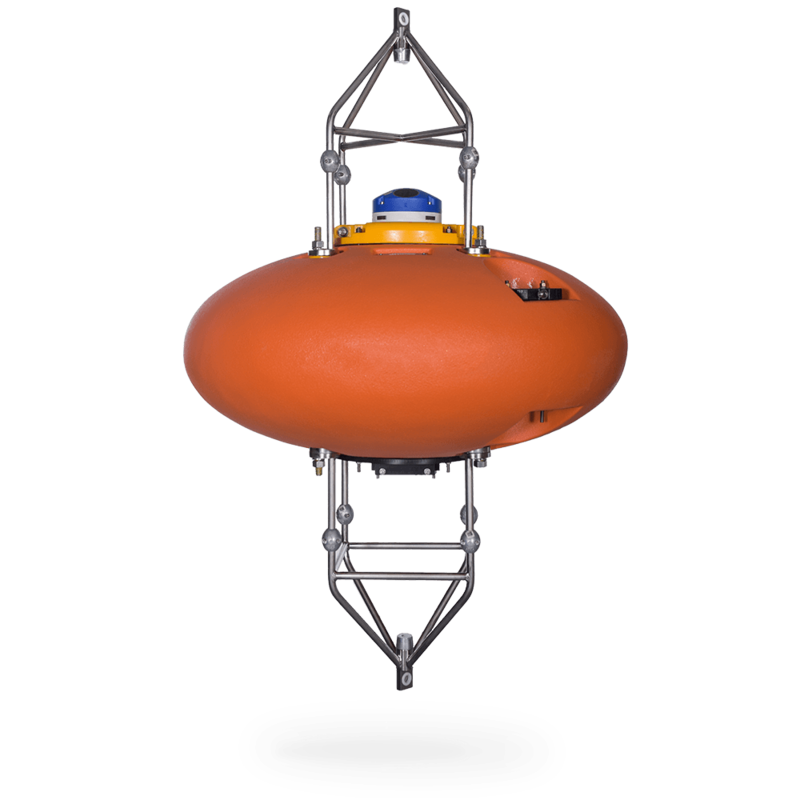 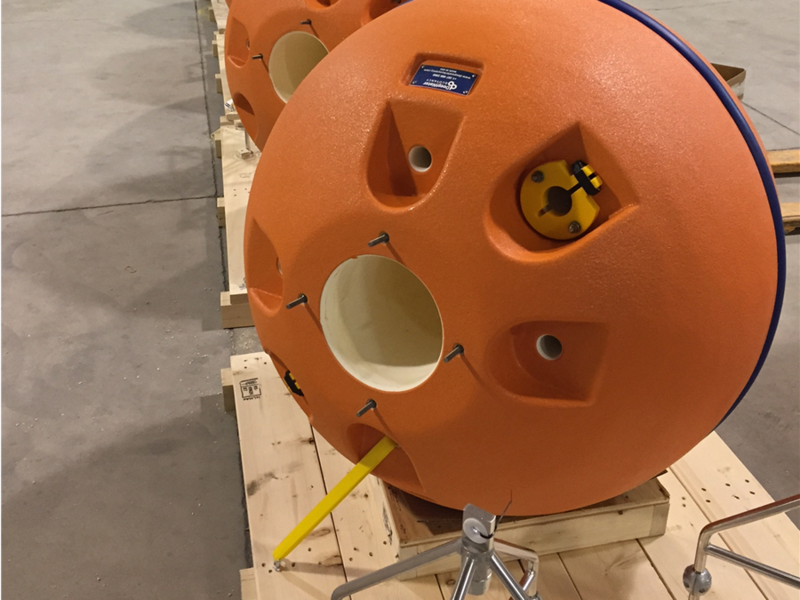 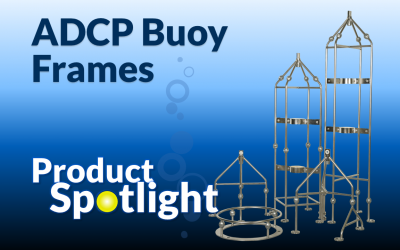 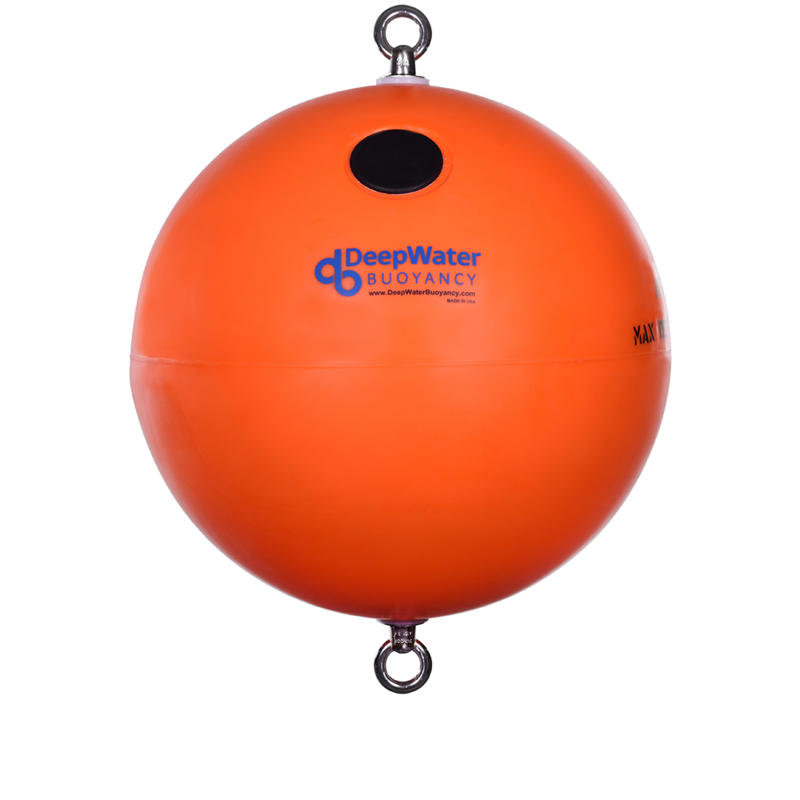 Manufactured from high-performance DeepTec® syntactic foam, adjustable urethane and UHMW instrument clamps, and 316L stainless steel and titanium hardware, DeepWater Buoyancy’s ADCP Buoys are designed to outperform and outlast conventional mooring flotation. 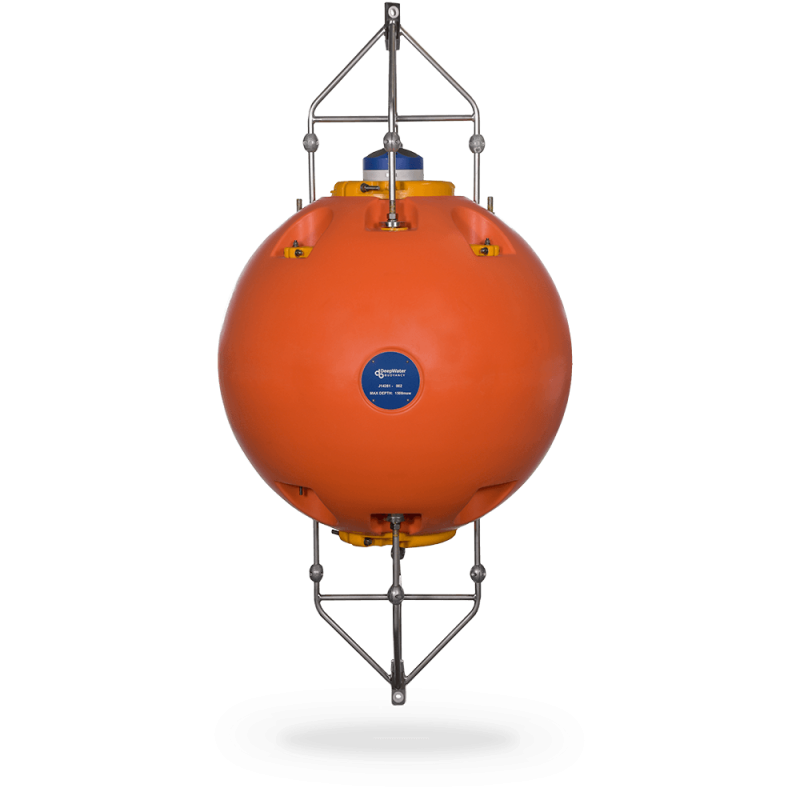 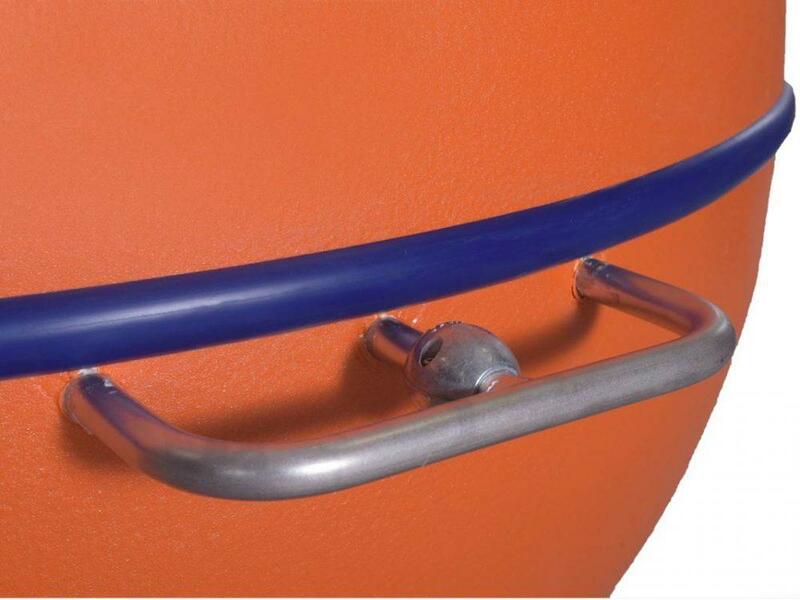 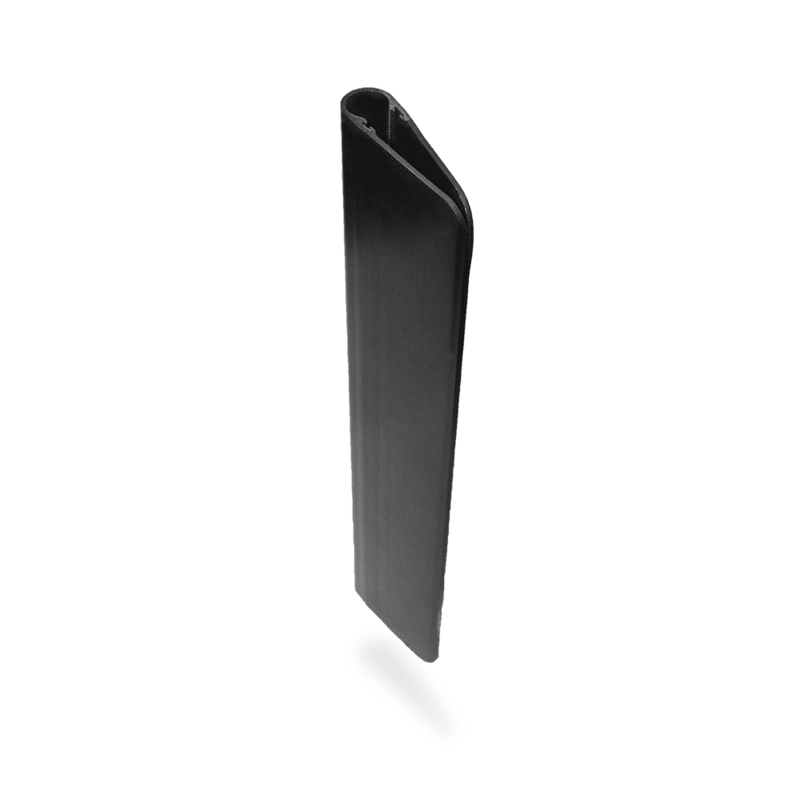 Available with depth ratings to 6000 meters, they require minimal maintenance and are extremely durable under the most rigorous deepwater conditions. 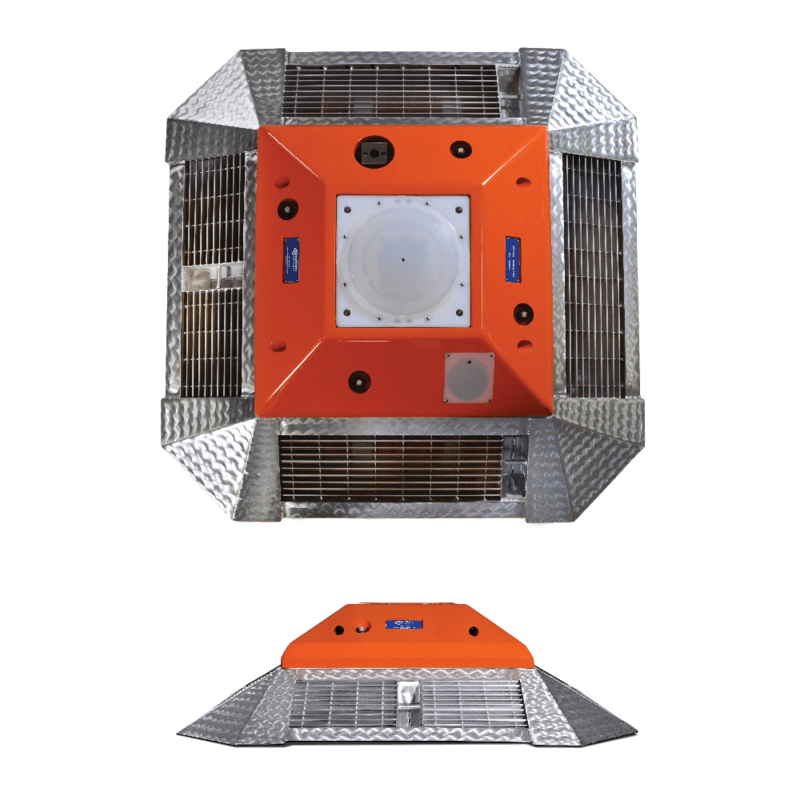 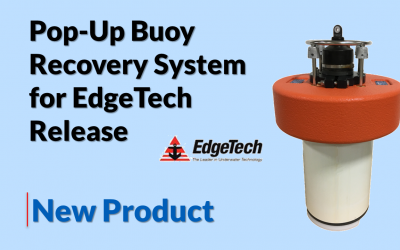 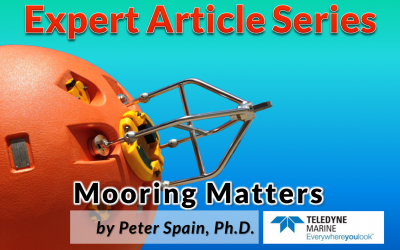 Designed by an experienced engineering staff that fully understands the effects of mooring excursions on data quality, galvanic corrosion and biofouling, these buoys are performance-proven and have a long track record of successful deployment and recovery. 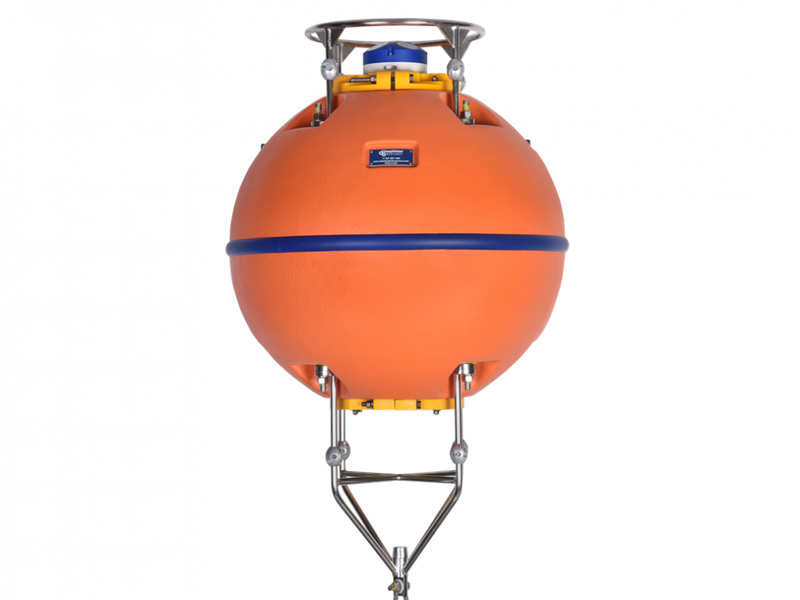 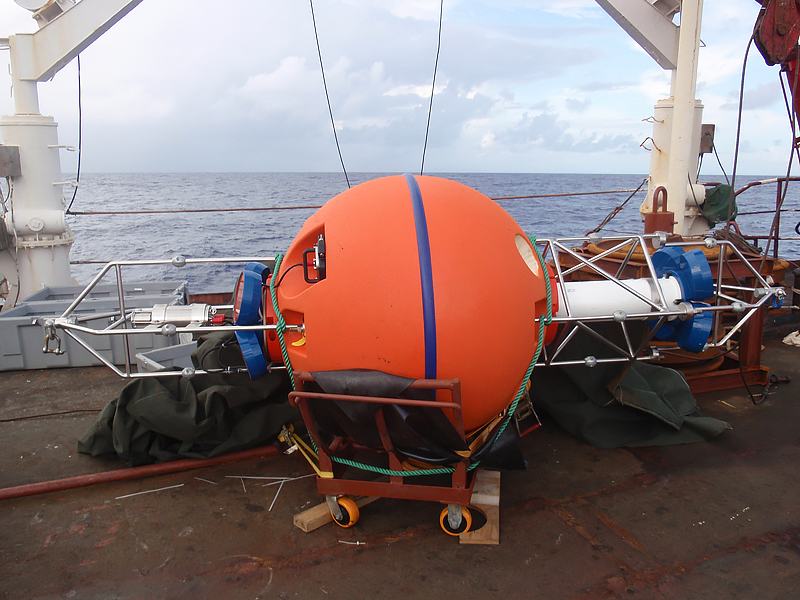 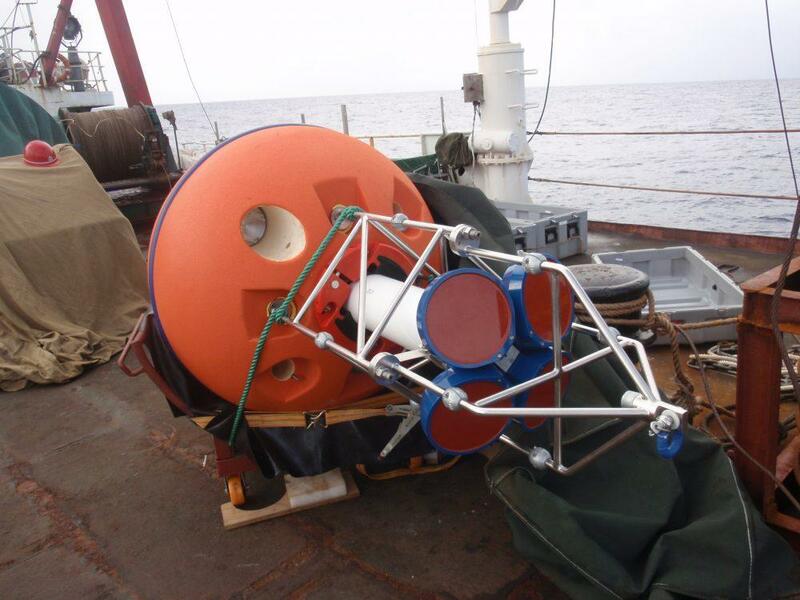 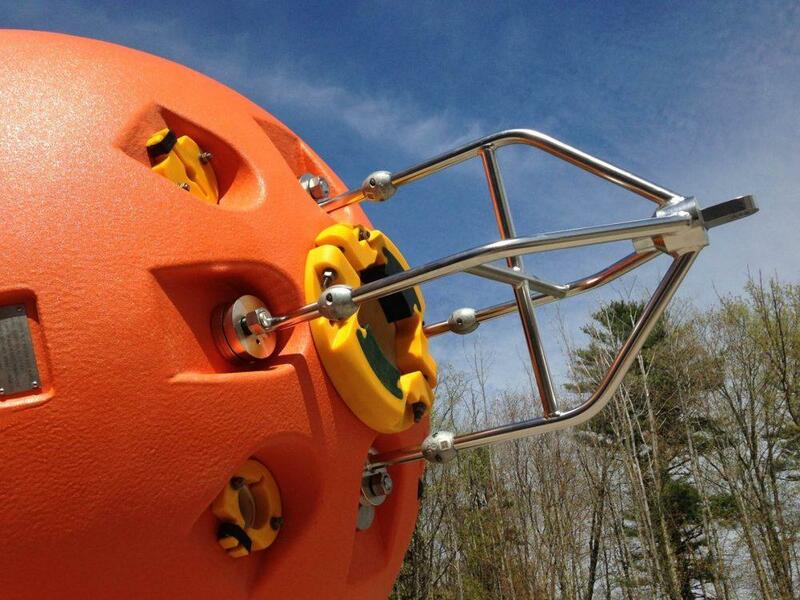 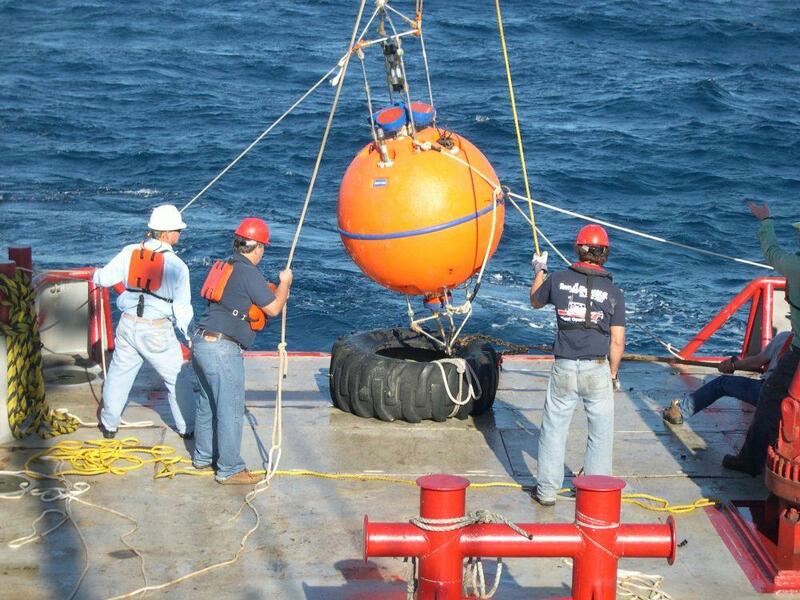 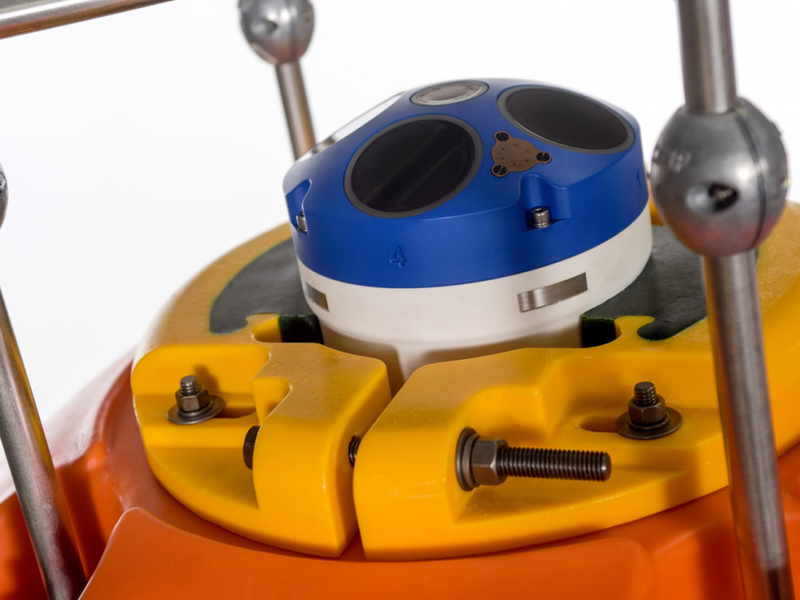 DeepWater Buoyancy Spherical ADCP Buoy outfitted with a "Ring Frame" for a 5-Beam ADCP. 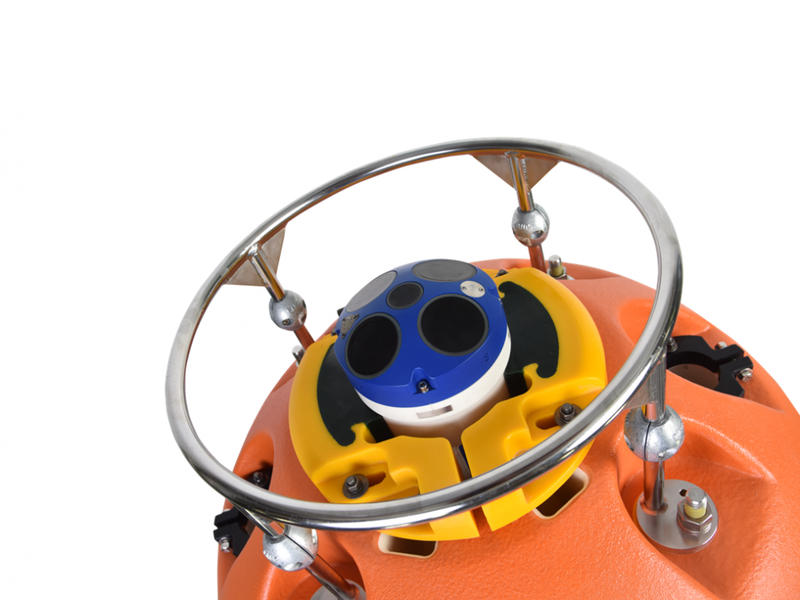 Teledyne RDI Sentinel V Shown. 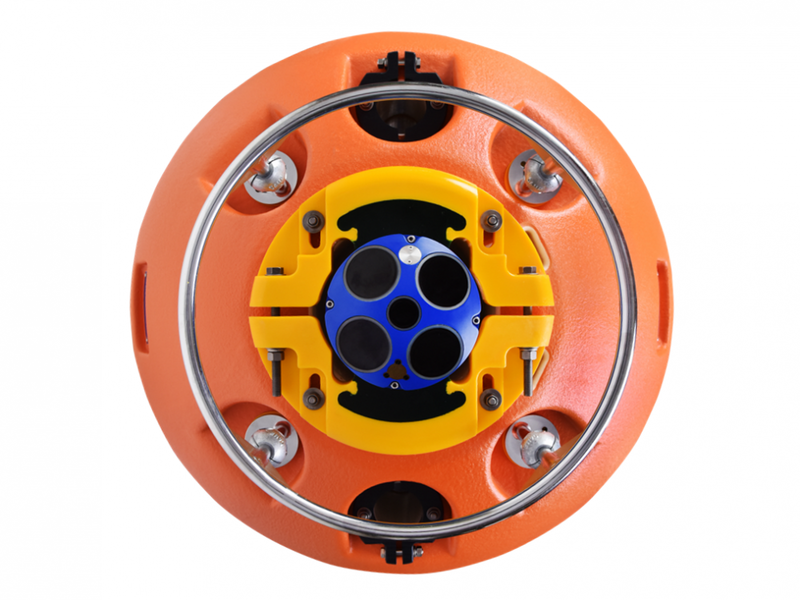 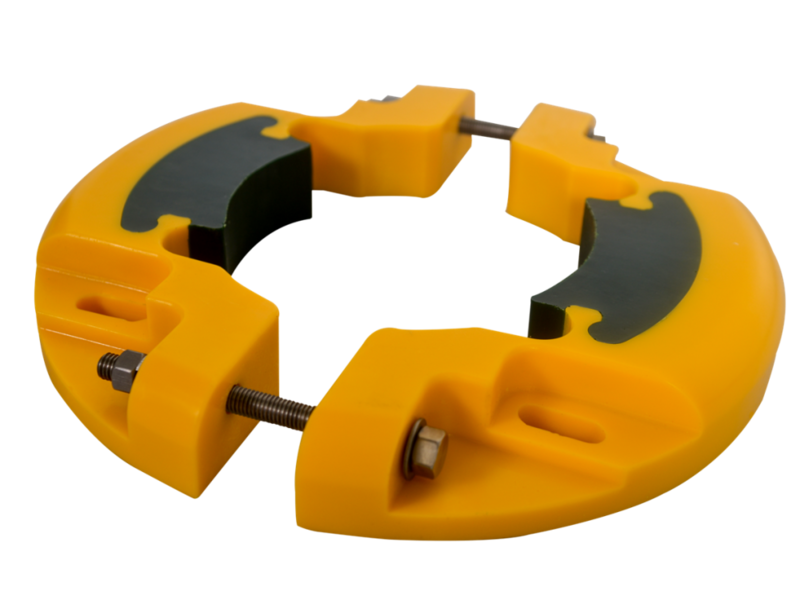 Top view of DeepWater Buoyancy "Ring Frame" for a 5-Beam ADCP. 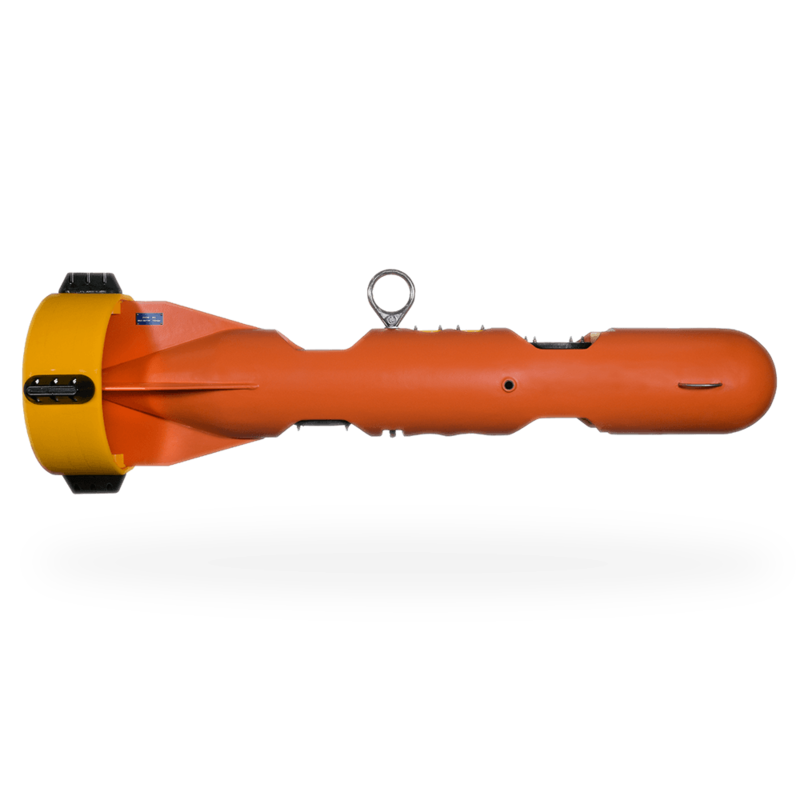 Teledyne RDI Sentinel V Shown. 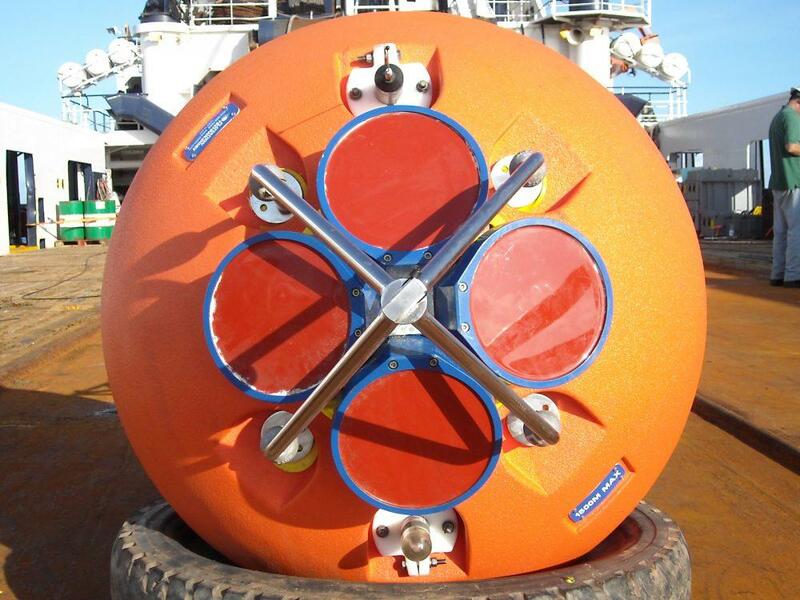 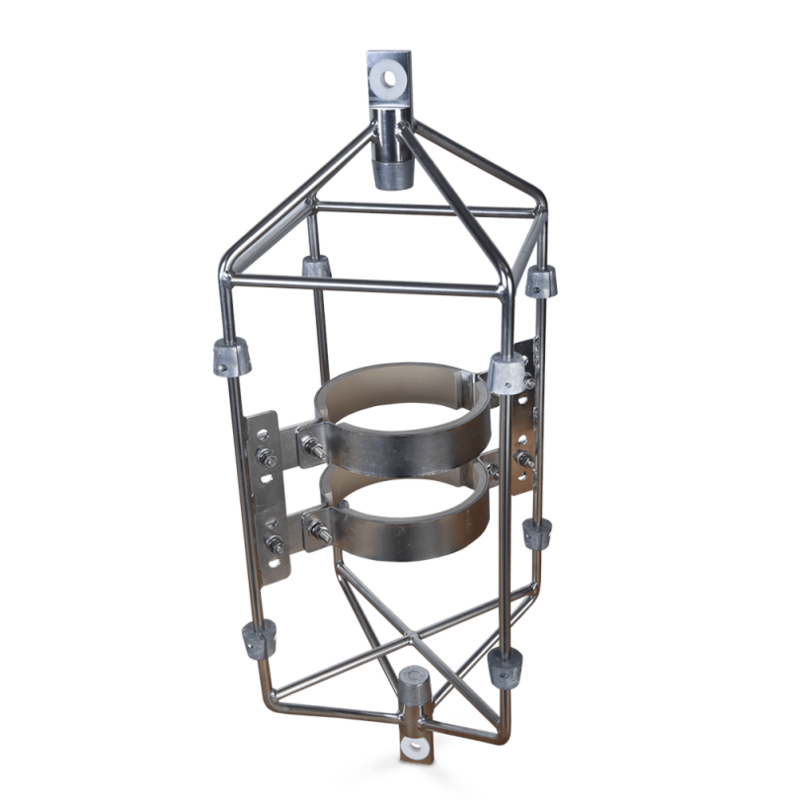 Close up of a DeepWater Buoyancy "Ring Frame" for a 5-Beam ADCP. 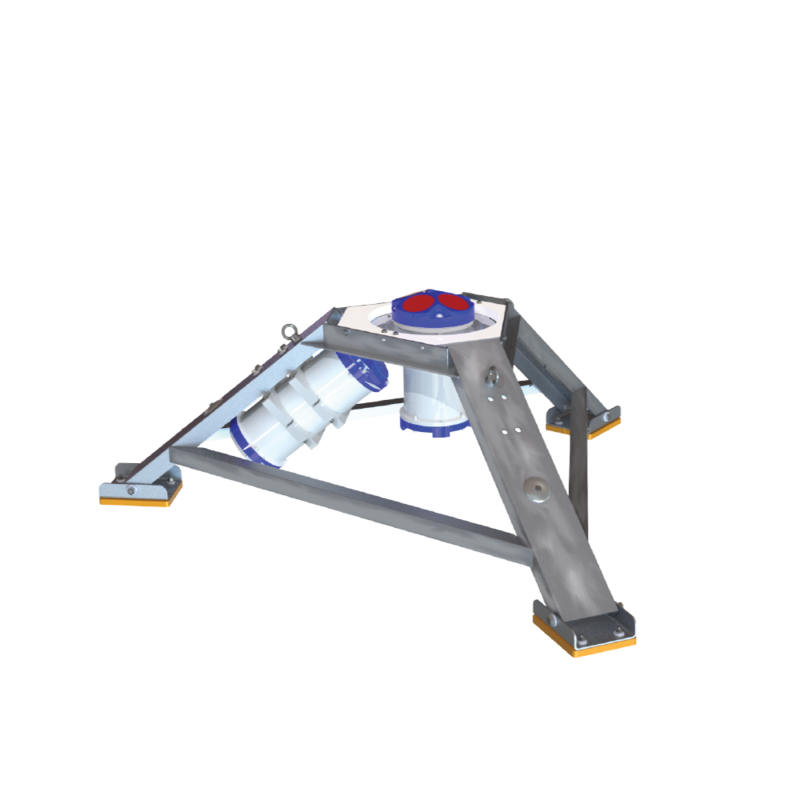 Teledyne RDI Sentinel V Shown.